The H5N2 strain of avian influenza doesn’t hurt people, but it can hurt chickens. Backyard chicken owners can bring the disease home to their flock if they are not aware of the potential threats or signs of sick birds. Avian influenza is not a problem in Georgia, yet. Commercial chicken producers are prepared to fight the virus that kills birds, and backyard chicken flock owners should prepare, too. While the commercial poultry industry in Georgia has the greatest risk in terms of potential for loss, it also has multiple safeguards in place and has limited exposure to migratory birds. Avian flu can more easily be introduced into Georgia through backyard chicken flocks. There have been no cases of human infection by birds because the H5N2 strain of the virus is not zoonotic, meaning it cannot pass between humans and animals. To protect backyard chickens, University of Georgia Cooperative Extension offers small flock owners these recommendations. Restrict access to your property and your birds. Consider placing the birds inside a fence, and only allow those who care for the birds to come in contact with them. If visitors have backyard chickens of their own, do not let them come in contact with your birds. Game birds and migratory waterfowl should not have contact with your flock. Keep chickens inside a pen or coop, and do not let them run free. Wear clean clothes when coming in contact with your birds; scrub your shoes with disinfectant. Wash your hands thoroughly before entering the chickens’ pen. Clean cages, and change food daily. Keep stored feed in enclosed containers and protected from wild birds and vermin. Clean and disinfect equipment that comes in contact with your birds or their droppings, including cages and tools. Properly dispose of dead birds. If you have been near other birds or bird owners, at a feed store or bird hunting, for instance, clean and disinfect your vehicle’s tires and your equipment before going home. Shower and put on clean clothing before approaching your flock. Keep any new birds or birds that have been off-site separate from your flock for at least 30 days. Do not share tools, equipment or supplies with other bird owners. If you do bring borrowed items home, clean and disinfect them before you bring them home. Early detection is critical to prevent the spread of avian influenza. 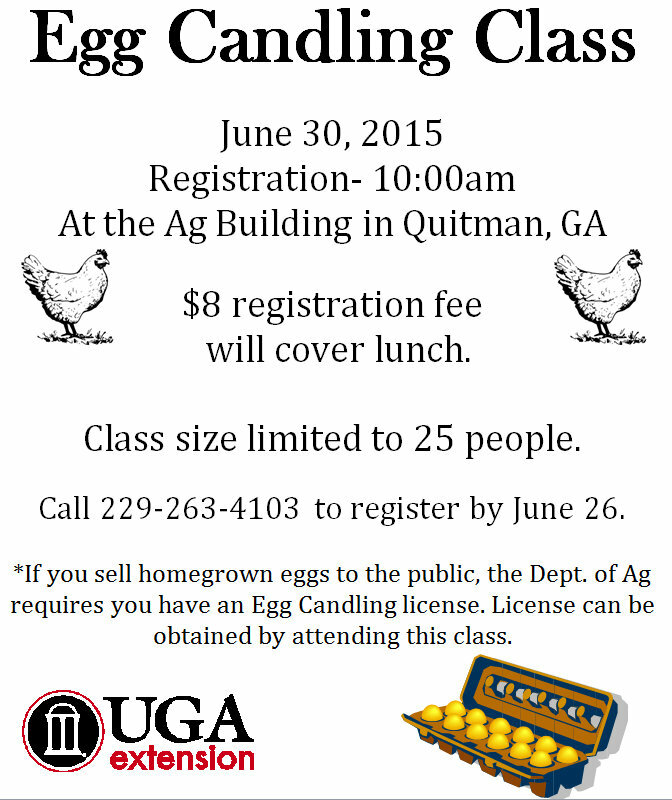 If you suspect your flock is infected, call the Georgia Poultry Laboratory Network at (770) 766-6810. 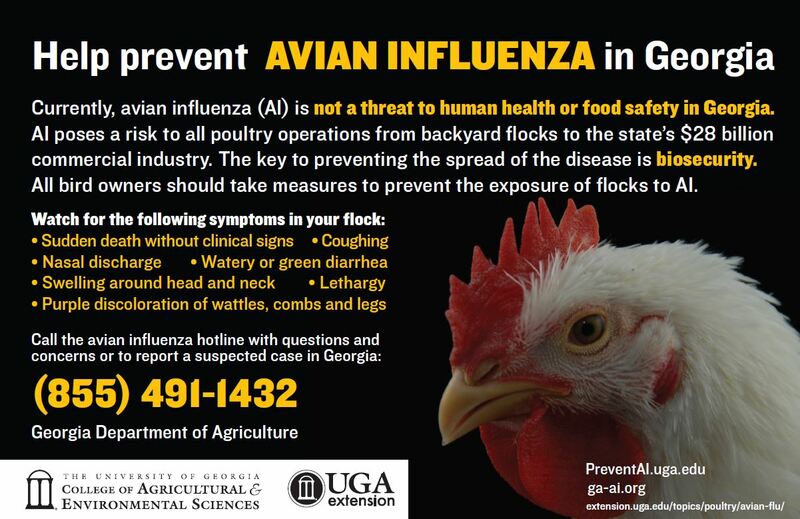 For more information on avian influenza, call the Georgia Department of Agriculture at (404) 656-3667. To learn more about how to care for backyard flocks, see the UGA Extension publications on the topic at extension.uga.edu/publications.